Some will never understand the pleasure others take in vanilla ice cream. Vanilla ice cream is sometimes treated like the middle child: neglected, even when it does great things, like act as the base of most of the flavors we know and love in the United States. Despite that important job, vanilla is seen by many as a plain, default flavor, more people have reached for flavors that are more exotic, and make them feel like they’re traveling to a place that is far from home. Making the case for vanilla isn’t hard abroad, where it is less common, but other countries have their own version of vanilla, a common default flavor that is widely available, and makes people comfortable. Try different flavors common elsewhere in the world, reach for specially-flavored ice creams and you’ll get an amazing experience. As the name would suggest, thai tea is drink that originates in Thailand, and is drunk different ways all over the country. Thai tea mochi has thai tea ice cream, and matching rice dough that makes the whole package. Thai tea is usually strongly-brewed and highly-caffeinated black tea, sweetened with condensed milk and cream. Thai tea is popular in Thai restaurants all over the world and outside of Thailand, and is a popular flavor of boba milk tea. Plum wine was once only enjoyed by aristocrats in Japan. Plum wine is a dense and sweet white wine, usually served in a tumbler with a ball of plum in the bottom of the glass. Plum wine is a traditional wine in Japan, and is still enjoyed today, though it doesn’t have the reputation of sake. 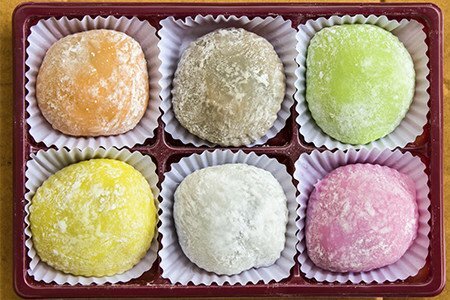 Because of its uniquely dense and fruity flavor, plum wine makes a great mochi. This also fits the recent trendy of boozy ice cream that has taken several countries by storm. How strong the alcohol is inside of the ice cream varies from maker to maker, but you will always enjoy making plum wine mochi part of your evening. Uniquely smoky with a chocolatey finish, black sesame wasn’t a flavor known outside of China, Japan, or Korea until the last decade or so. Making the unique flavor involves steeping the seeds, and blending them with milk. Some mochi makers don’t strain the fragments of the sesame seeds, giving the eater a grainy texture experience. Due to its growing popularity, but remaining relative obscurity, black sesame can be hard to find outside of Chinese or Japanese ethnic enclaves in major cities. This versatile purple yam is eaten all over Asia, including Polynesia. Taro is a slightly sweet, nutrient-rich vegetable that yields itself to a variety of desserts, including ice cream, sweet buns, cakes, and cheesecake. Taro has been gaining popularity since 2004, when Filipino-American communities’ varied and complex cuisines started gaining more visibility in major American cuisines. A fruit that is both loved and hated, durian is another nutrient-rich fruit. Durian, though, has an interesting conundrum: the smell of the fruit is incredibly pungent, and is off-putting for more people than it is appealing. Making anything from durian is an exercise in control of one’s gag reflex. The smell of durian is so strong, it is banned in certain public places, including public transit. The flavor is often paired with mango for a strangely pleasurable experience.